I've been meaning to publish this for months now, but with school and other commitments the latter half of 2017, I either lacked sufficient time and/or motivation to finish it. Well, I have some time now, so here it is. I'm determined to have some more blog activity in 2018. Today I was looking at some of the pictures I posted on my Instagram account, marveling that I even made the trip this post is about, and remembering why I even went in the first place. 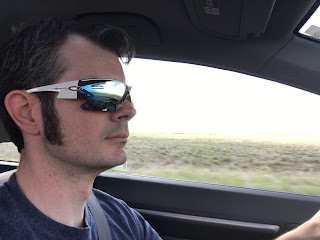 At the end of June and into early July, I had the opportunity to take what I billed as my "epic southwestern road trip", where I drove from Ohio to as far west as Phoenix, Arizona, and back again. 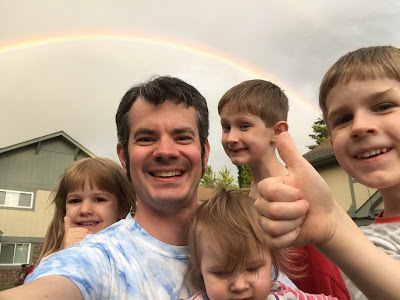 That it itself would've been quite the adventure, but I was able to make it so much more than that, not only in places I was able to visit and see, but even more so, the people I was able to reconnect with along the way. 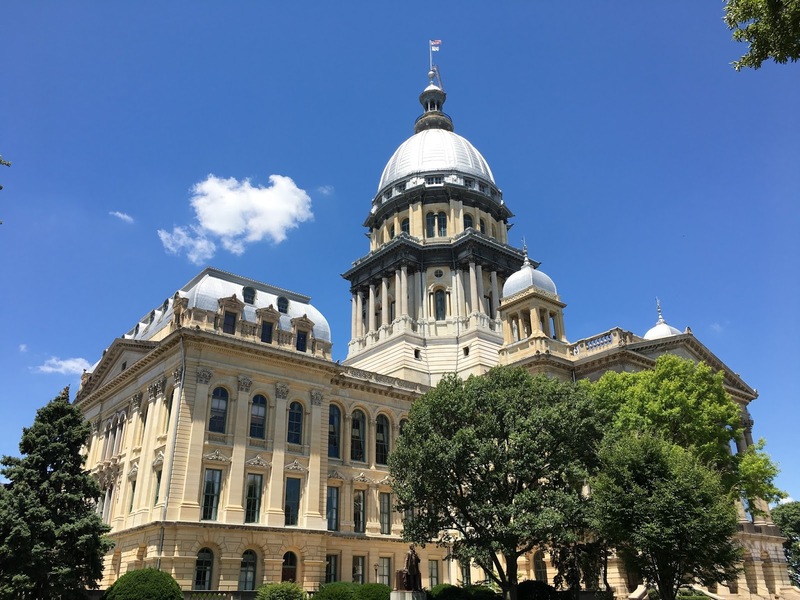 Sitting here writing about it, it's still hard to believe I was able to pull it off, though I'd be remiss if I didn't give credit where credit is due. There's no way I could've pulled it all off without the generosity and goodwill of so many friends and family who took time to meet with me, especially those who allowed me to stay with them for a night or two. I was reminded how many wonderful people I have in my life, and hope I have the opportunity to return the generosity in the future. Words cannot adequately express how appreciative and grateful I am for the kindness and love shown to me throughout the trip from so many people. 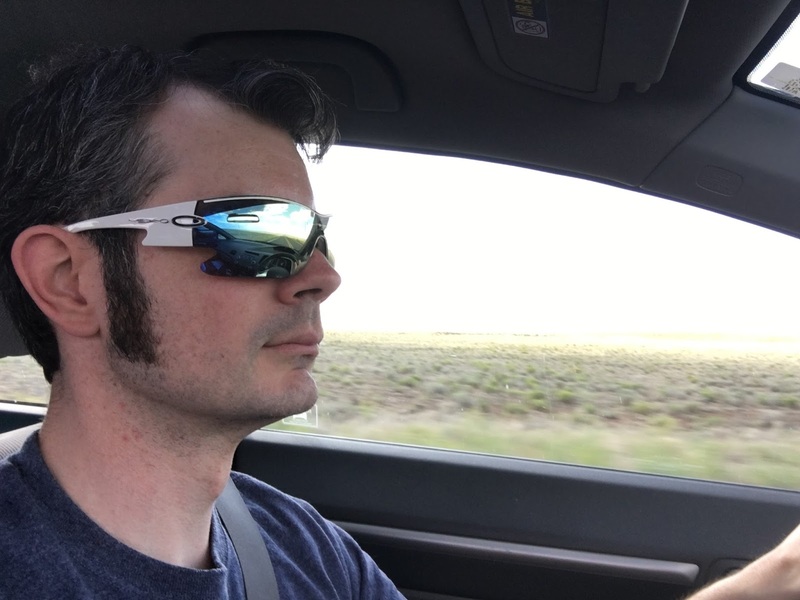 Of course, driving to Arizona from Ohio is a looooong ways, so I made sure to plan many stops, not only to make the trip more interesting, but also to see more people. 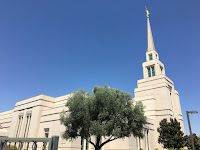 In the end, it turned into a trip to almost all of my old mission areas, on top of seeing seven LDS temples, games at four new Major League ballparks, and all of my siblings, nieces, and nephews. The other variable of the trip that certainly made it memorable was my car's lack of air conditioning. 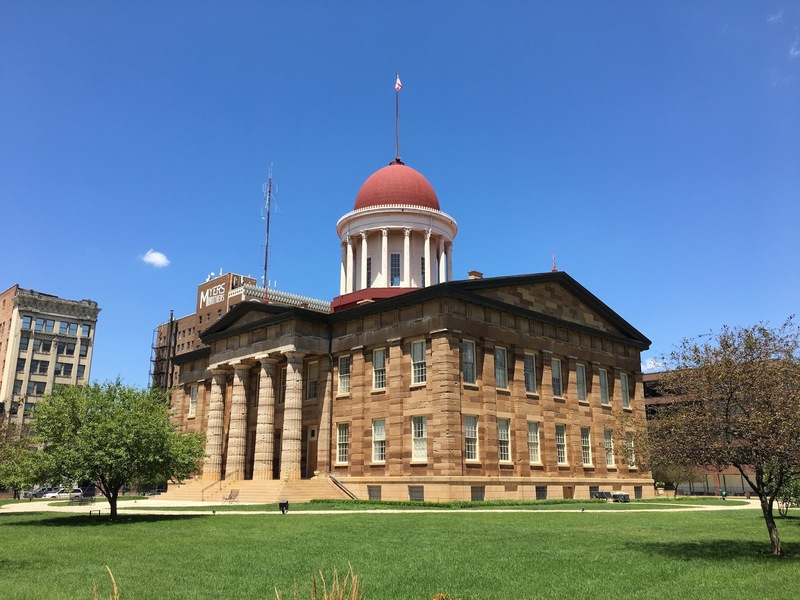 The air compressor has been in need of replacement for the last two years, but the $1,000 or so to fix it just hasn't been in the budget. That made for some pretty hot days of travel, especially in Texas, New Mexico, and Arizona, where temps got as high as 110 in New Mexico and 118 in the Phoenix area. Let's just say I have a new perspective on heat and that the 86 degrees I felt in St. Louis later in the trip didn't feel as hot as it used to! 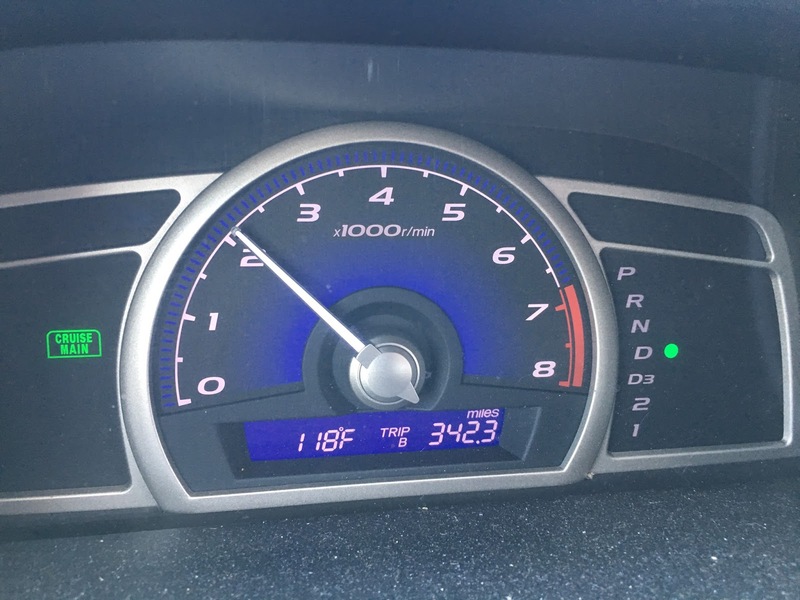 Dashboard outdoor temperature in Mesa on June 24 (47.7* C). And yes, it was accurate. 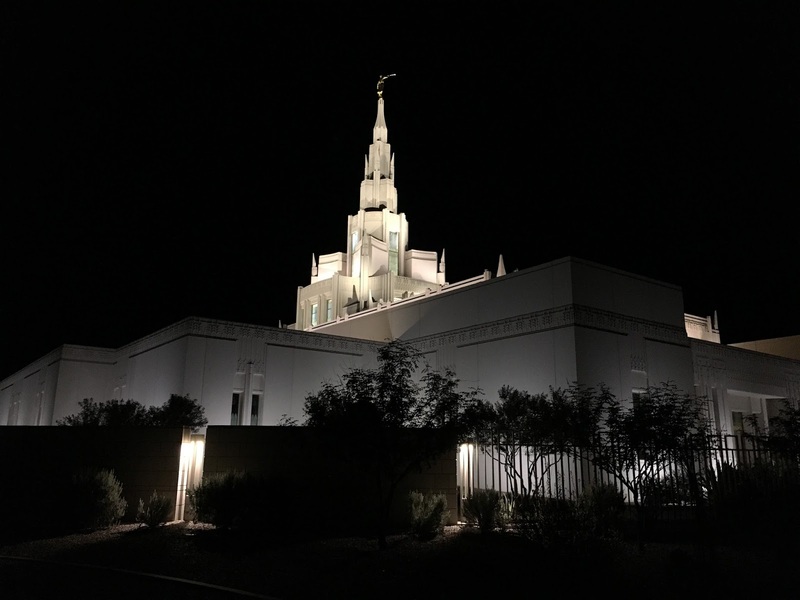 My main inspiration for the trip was the open house for the new Tucson Temple of The Church of Jesus Christ of Latter-day Saints. 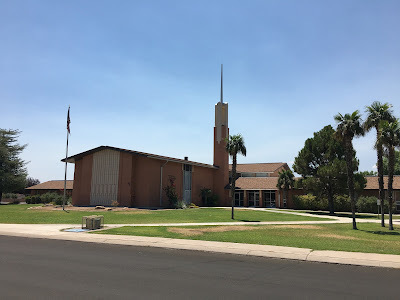 I served as a missionary in the church's Arizona Tucson Mission from December 2001 to November 2003 and was based in the Tucson area in early 2002, serving in Oro Valley (just north of Tucson) from January to June 2002. Even after I was moved to other areas of the mission, I returned to Tucson several times in the course of the two year mission since it was where the mission headquarters are. I left the mission in November 2003 after a two-week tour with my mom and grandma to visit all of my former areas. 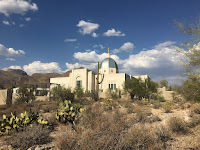 In 2006, I was able to visit my final three areas in New Mexico as part of an extended trip home to Ohio from Idaho, but for Arizona, I hadn't been back to my old areas since that mission-ending road trip with Mom and Grandma. In some cases, this was my first time seeing some people and places in 15 years. 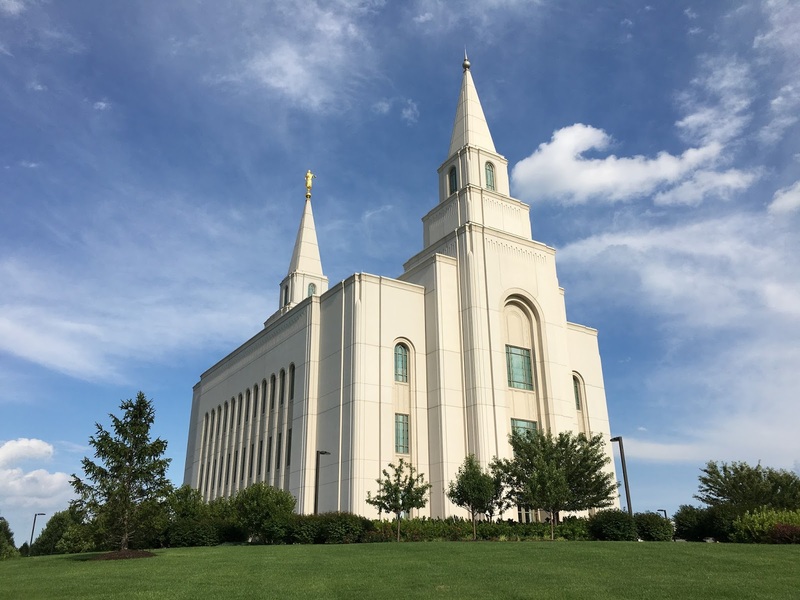 The temple open house started June 3 and ended June 24, so I just made it for the last day. 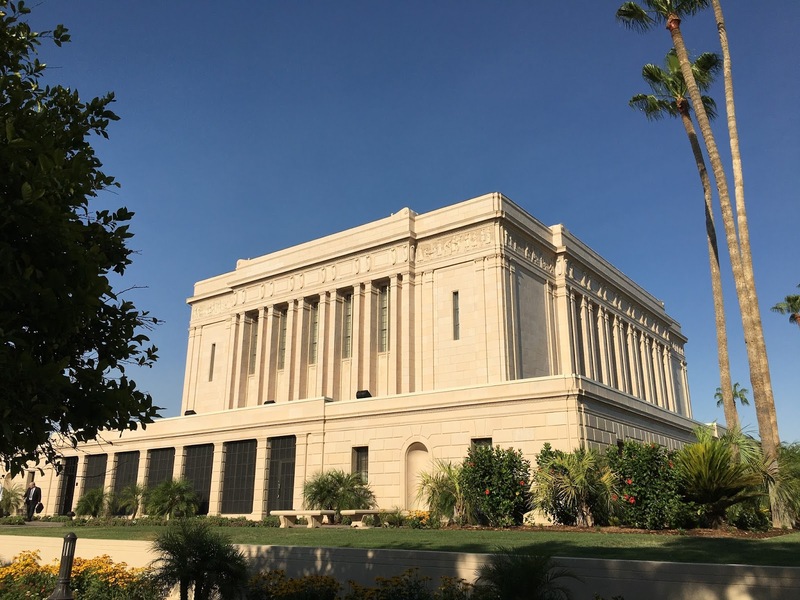 I always said I'd try my best to get back to the mission if Tucson ever got a temple, so when the schedule aligned to make it possible, I decided to make a huge trip around it. On the trip, I did my best to go to all of my old areas, getting them all except Animas, New Mexico, and Sierra Vista, Arizona. In the end, it was an issue of timing and distance that prevented me from getting to those two locations. 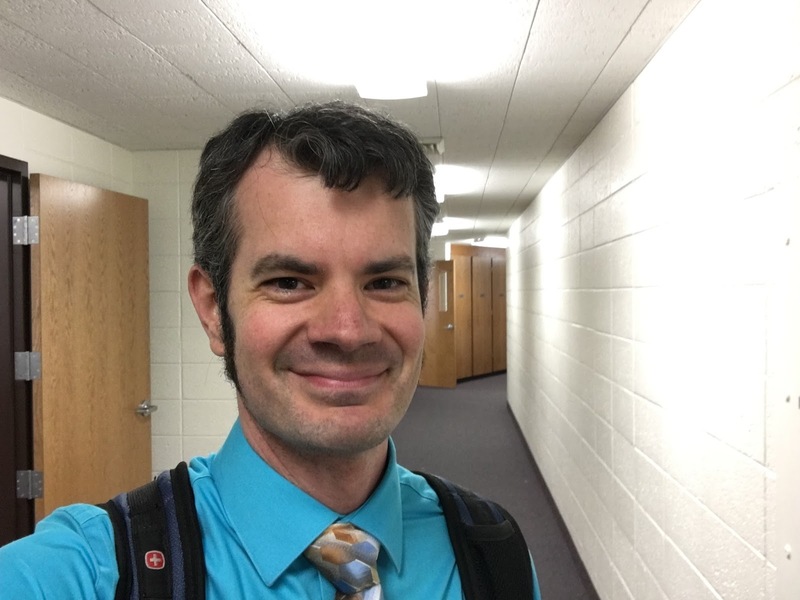 They were also both the two areas I spent the least amount of time in on my mission (Animas 1.5 weeks; Sierra Vista 10.5 weeks) and don't really have any connections in either place. 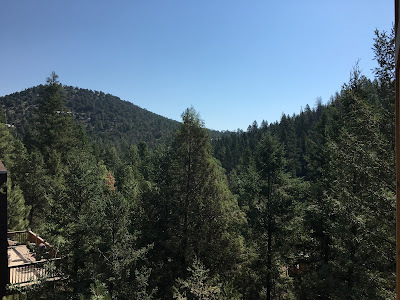 I re-entered what was my mission (the boundaries have long since changed) via Ruidoso, New Mexico, where I stayed for a night, then stopped in Alamogordo and Las Cruces on the way to Phoenix the next day. I served in Las Cruces from December 2002 to late February 2003, followed by Alamogordo from February to August 2003, then Ruidoso from August to November 2003. I last visited those three areas in 2006, when I went there for the opening of the new Ruidoso chapel since it was scheduled right after my spring semester ended at BYU-Idaho. Was soooo good to see the green and trees of Ruidoso again after driving across west Texas and eastern New Mexico. Enjoyed seeing some special people I hadn't seen in awhile! Sister Jensen (above) and Sister Magill (below) were two people I was very close to while I was serving in Ruidoso, and I'm glad I was able to see them again for the first time in awhile! Sister Magill even set up a place for me to stay at her neighbor's cabin. So grateful for that! When I was a missionary in Ruidoso, this building was in the works. I came back in 2006 when it opened and it has since been expanded and renovated. Wonderful site! Despite serving in Alamogordo for six months, I don't have any regular connections who still live there. All of the connections I did make there have all moved on, mostly because the area of Alamogordo I covered included Holloman Air Force Base, so they have all been moved. 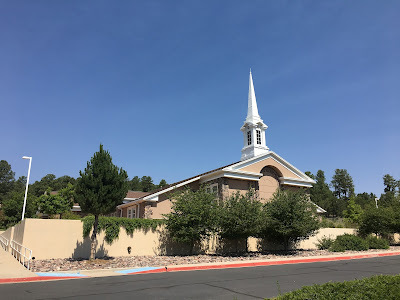 In both Ruidoso and Las Cruces, I was able to visit with some people I have stayed in touch with since my days as a missionary. In all of my former areas, I made sure to stop by the church building we attended and my old apartment. It was surreal to be at my old apartments in each place. So many emotions and memories at each place, especially my first apartment in Oro Valley, where I spent my first six months in the mission field. 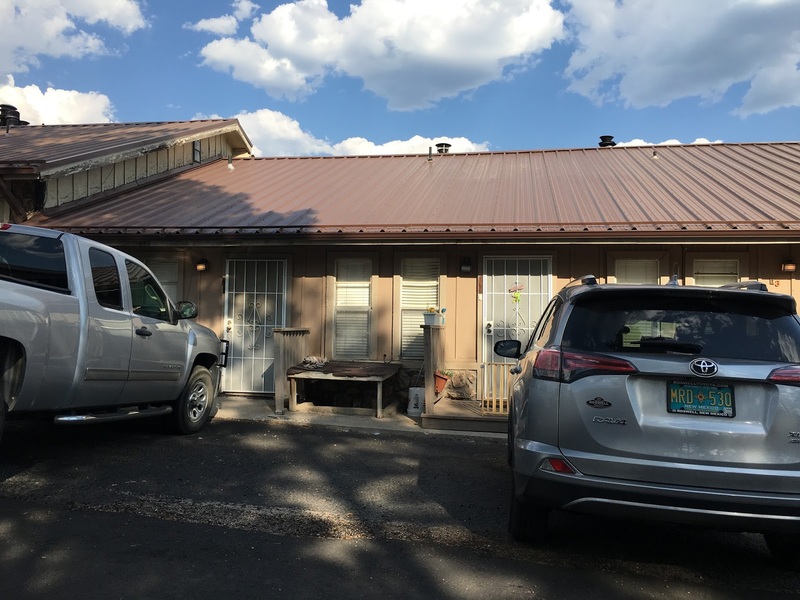 In Safford, my old mission apartment still has missionaries living there, so I knocked on the door and they happened to be home for lunch! 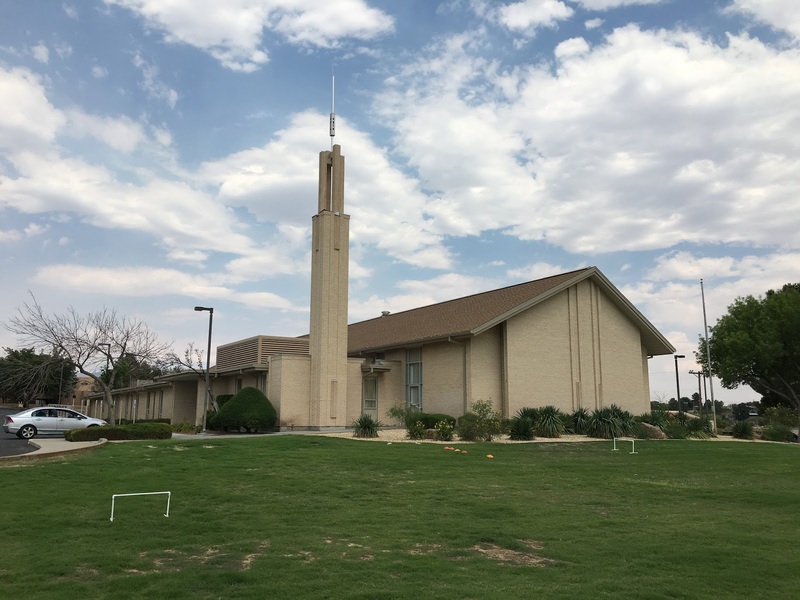 The church building I attended while I was a missionary in Alamogordo from February to August 2003. Lots of good memories here! I actually lived in two apartments in this building during my 6 months in Alamogordo, from late February to August 2003. 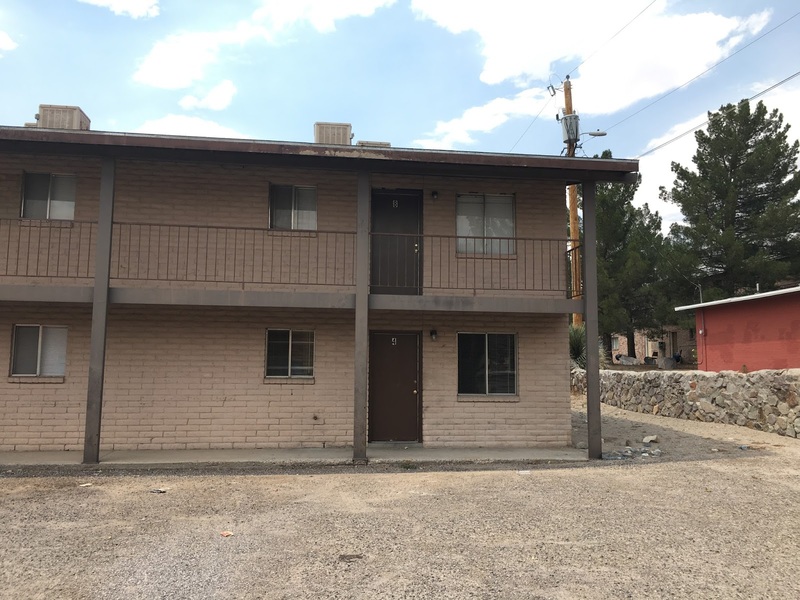 When I arrived in Alamogordo, we lived upstairs to the left (apartment G) in a studio apartment. I was successful in getting us moved downstairs to apartment C (door in center) a few weeks later, which was a one-bedroom that was obviously a bit larger also had a much better washer and dryer. 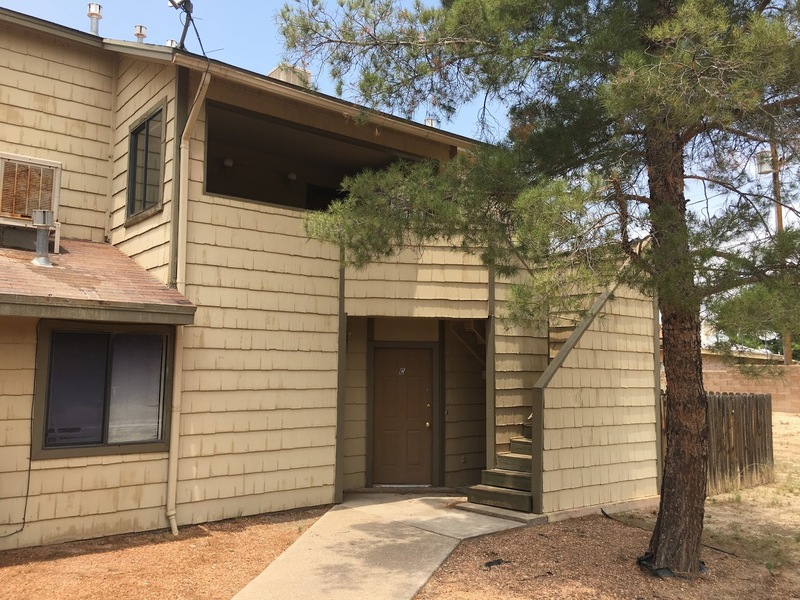 My apartment in Las Cruces, along La Fonda Drive just west of I-25, where I lived for 12 weeks from December 2002 to late February 2003. It looks exactly the same. 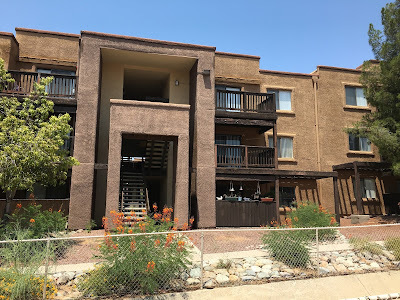 We lived upstairs in the very last one on the right and used the laundry facilities in the red building on the right of the picture (which were actually for an adjacent complex...oops!). It is a 2-bedroom apartment and actually wasn't too bad. I spent Christmas 2002 here! The church I attended for the 12 weeks I was in Las Cruces, from December 2002 to late February 2003. That's my car on the far left! It was 110* F when I took this photo! 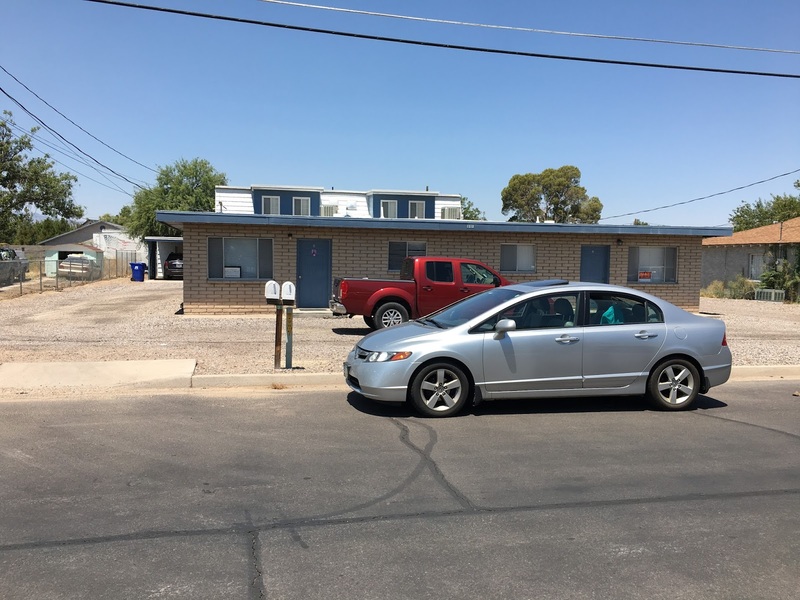 My car in front of the apartment I lived in while I served in Safford, from June to September 2002. It's the one on the left and has the picture of Jesus on the door and a sign in the window. I was able to see inside for a bit and it looks pretty much the same! 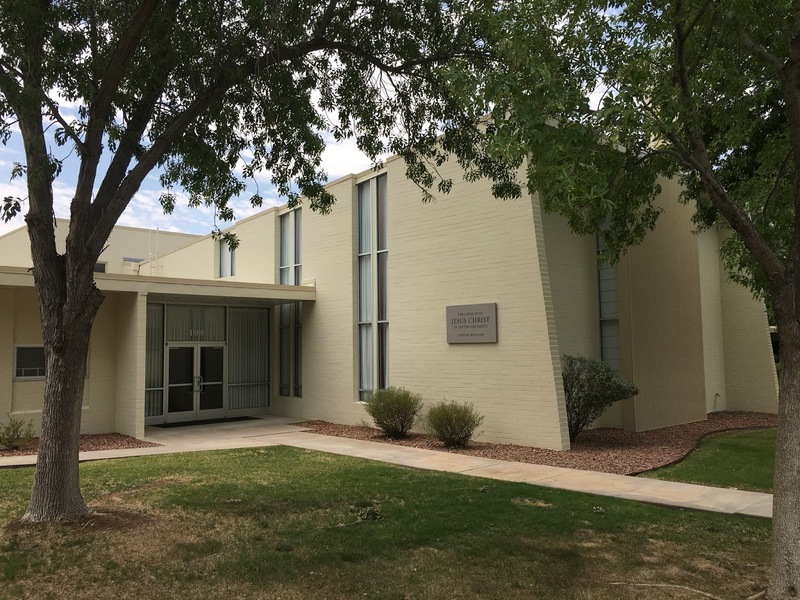 One of the buildings I attended church in when I served in Safford. We covered 3 wards initially (2nd, 3rd, and 6th wards), and eventually 4 wards (added 5th ward halfway through my time there), so Sunday was a busy day. 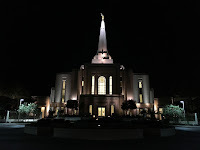 This is the Safford Stake Center, just around the corner from where we lived. The fun part about this building was the steeple had a ladder inside of it and a door near the top that we found one day. I got some pretty cool pictures from up there! The other building we attended was just behind this one, the 20th street chapel. I was able to attend church in Oro Valley, attending some of the meetings of four different wards. As a missionary I covered two wards, Catalina and La Canada, but the boundaries for each are vastly different now. 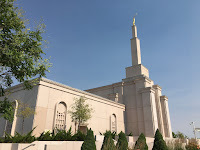 Within the area I covered are now four or five wards, so to see some of the familiar faces, I had to go to not only those four different wards, but two different buildings as another building was built in my old area years after I left (it was being planned when I came back at the end of my mission). For the most part, I saw many familiar faces, but being 15 years since I served there, hardly anyone recognized me, which I expected. 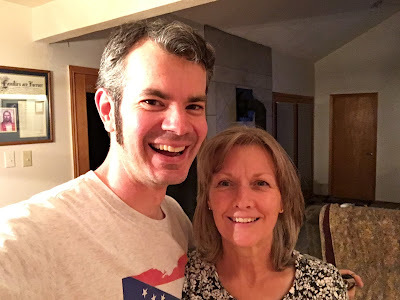 I was able to connect with and re-connect with some people from my "greenie" area, though, so that Sunday was very special. 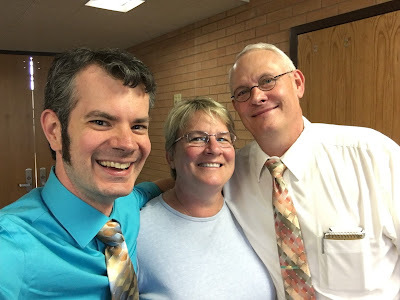 With Tim and Doreen Windsor in the Tucson North Stake center after church. I got to know them really well when I was a missionary in their ward back in early 2002, and Doreen was the first person I saw baptized on my mission. With Don Cox and his grandson after church. Br. 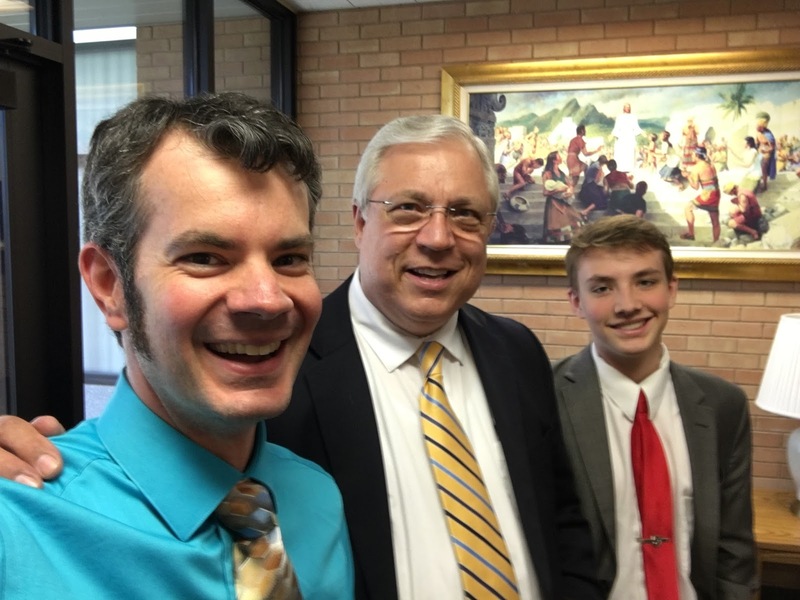 Cox was the Ward Mission Leader or assistant at the time Doreen Windsor got baptized. Baptism of Doreen Windsor, February 12, 2002. Back in the building I attended church in for the first 6 months of my mission, January to June 2002. I was surprised how little I remembered about the interior of the building, at least as far as the smaller classrooms. 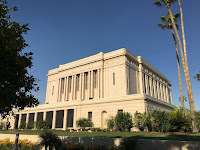 The Temple Open House used this building as a staging area, where visitors parked, watched a video, then were bused over to the temple. The last time I was in the building was when I visited at the end of my mission in November 2003. This is where I lived the first 6 months of my mission, from January to June 2002. My apartment was #363, the bottom floor center. It was surreal being back here...so many memories and emotions flooding back. 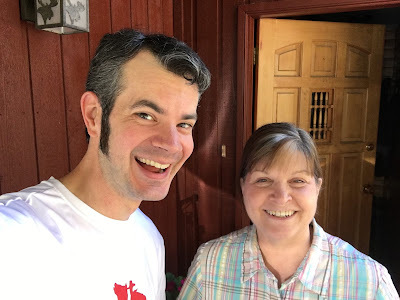 I was able to reconnect with mission friends along the trip in other places too. In particular, I was able to visit with the Davis family, who I knew in Las Cruces. I visited the youngest brother in Las Cruces while I was passing through, then with one sister for two nights in Phoenix (and got to finally meet her wife), then the oldest sister for a night and all her kids in Albuquerque as I headed home. 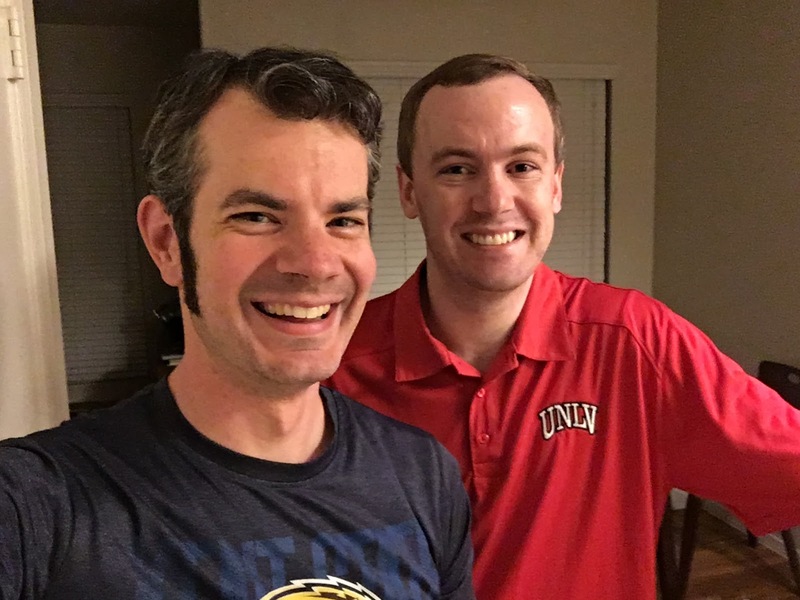 The next two nights after that I stayed with a former mission companion, now in Oklahoma, who I had served in Las Cruces with! With Tommy Davis when I stopped in Las Cruces. I knew the Davis family in Cruces, but he's the only one left! I also got to know their grandma Margie Davis as she was in the area I covered in Alamogordo right after I was in Cruces. Crystal (right) and Clara Tedrick-Davis (right) in Mesa, AZ, where I stayed for two days. So fun and so appreciated! 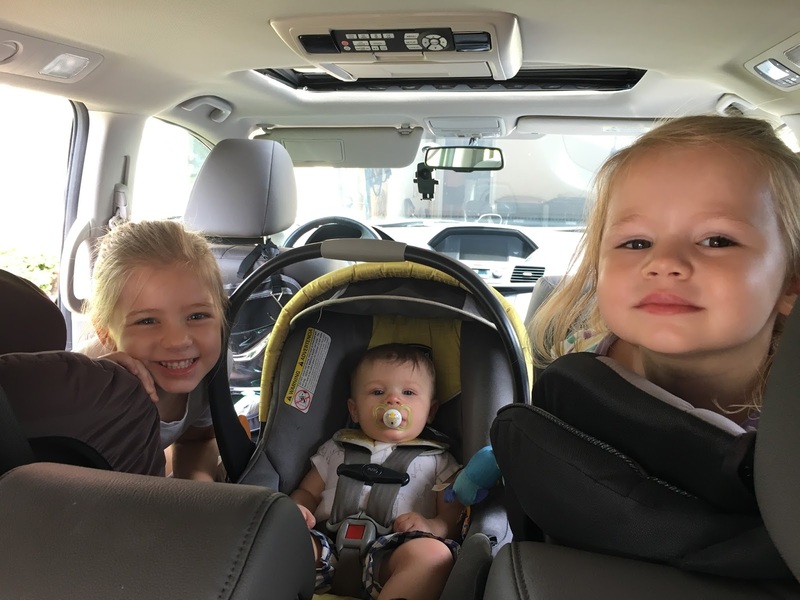 Tiffany (Davis) Daumueller and four of her five kids. Her husband Drew, who I also got to know very well while I was in Las Cruces (when I knew them, those two were still dating in high school!!! ), was out on business. 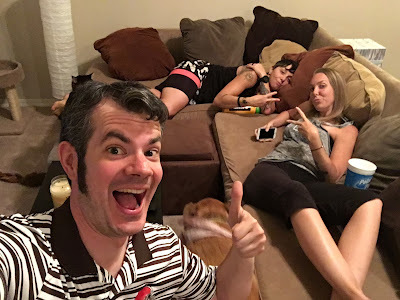 I stayed with this fun crew in Albuquerque for a night as I started heading home, which was most appreciated! 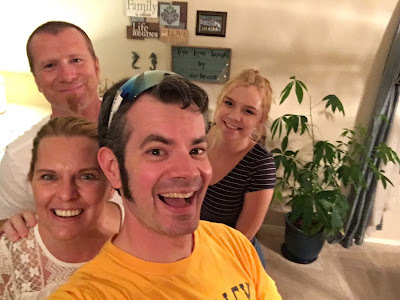 With Will Graff (right), his wife Megan and brother Geb in Enid, Oklahoma, where I stayed for two nights on my way back to Ohio. Will and I were companions in Las Cruces for 12 weeks. Always good to see him and his crew, plus I appreciated the lodging! Since a temple open house was the main event I did the trip, I guess it was only appropriate I saw so many temples during my travels. 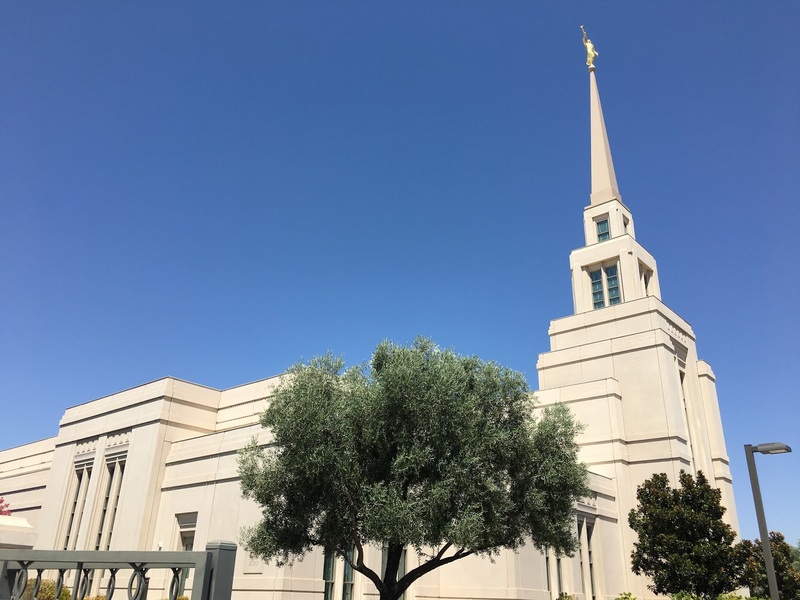 In addition to the Tucson Temple, I was able to see the three temples in the Phoenix area (Phoenix, Gilbert, and Mesa), the Gila Valley Temple, the Albuquerque Temple, as well as the two temples in Missouri: Kansas City and St. Louis. The Gila Valley Temple is near where I served in Safford, but was built several years after I was there. Sure wish it had been there when I was a missionary! Even so, I'm glad it's there now. 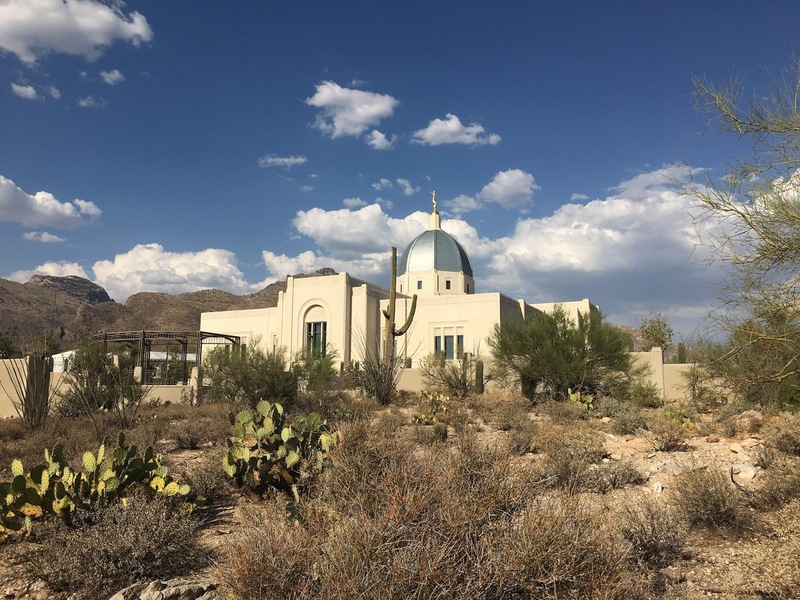 As for the Tucson Temple, it's a beautiful temple in a great location and is very close to where I lived when I was in Oro Valley. 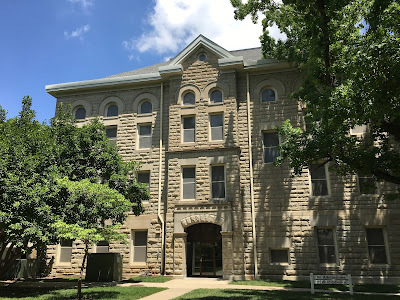 Not only did I attend the open house, but I went back to the site the next day I got a few more pictures. 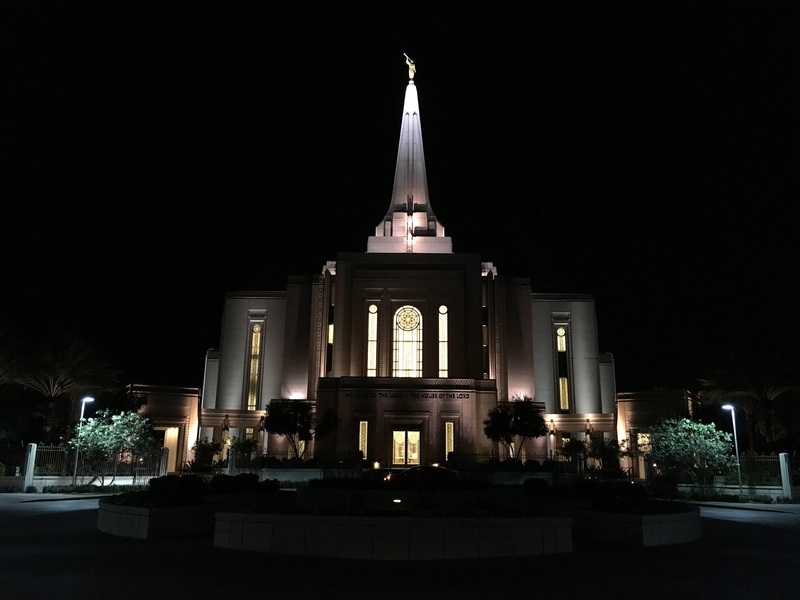 While I wasn't able to go in any of the temples (besides Tucson), seeing them from the outside was still wonderful. I've always enjoyed temple architecture, so it was great to see all the different styles. 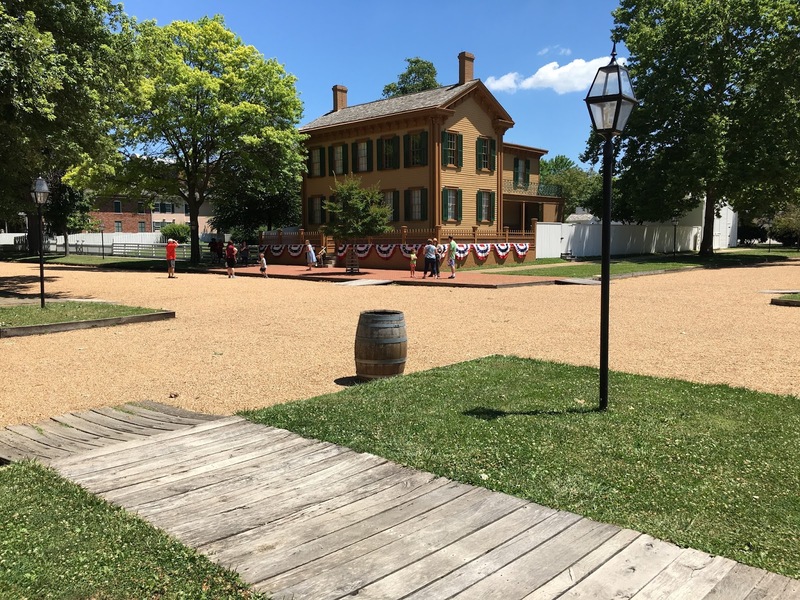 In the Kansas City area I was also able to stop by the historic sites in Independence and at Far West. 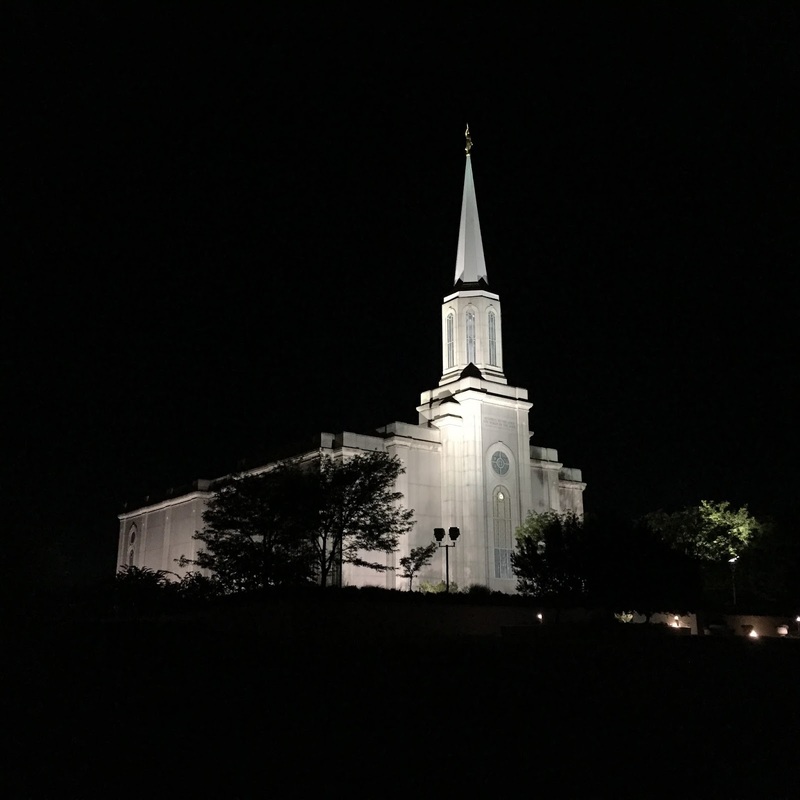 I enjoyed both, but especially the beautiful site of the Far West Temple. Such a quiet, peaceful, and beautiful place. I've been to most church history sites, but Far West was one I hadn't been to yet, so I was glad to finally see it. Church history has always been a major interest of mine, so I most definitely appreciate how accessible and affordable (FREE!) it is to visit. Far West Temple site, north of Kansas City. At each corner are the original cornerstones for a planned temple that was never built because the Saints were driven out of Missouri in 1838. Far West was a pretty happening place in its heyday, but is now quiet and isolated. I really enjoyed my visit there...so quiet and beautiful. The Greater Temple Lot in Independence, Missouri, where three of the Latter Day Saint movement churches have a major presence. 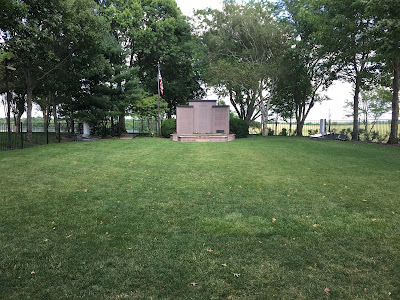 A temple was planned here in the early 1830s, but never got beyond a single cornerstone. 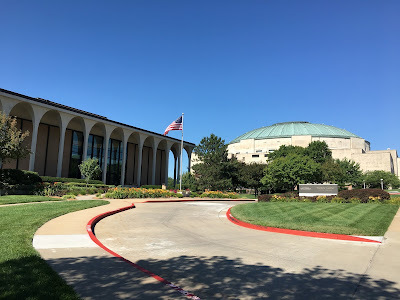 The building here on the left is the LDS Visitor Center, while the domed building in the back is the Auditorium of Community of Christ, previously known as the Reorganized Church of Jesus Christ of Latter Day Saints. I really wanted to tour the Auditorium, but every time I come to Independence, it's not open. 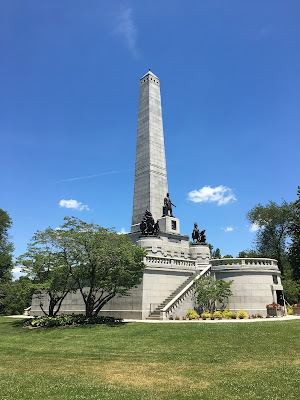 :/ I did make a quick visit to our Visitor Center and watched one of the new movies on Oliver Cowdery. Love our Visitor Centers! More of the greater temple lot. The small white building is the Church of Christ (Temple Lot), who owns the actual temple site and has the original cornerstone in their building. Next time I visit, I plan on going through. 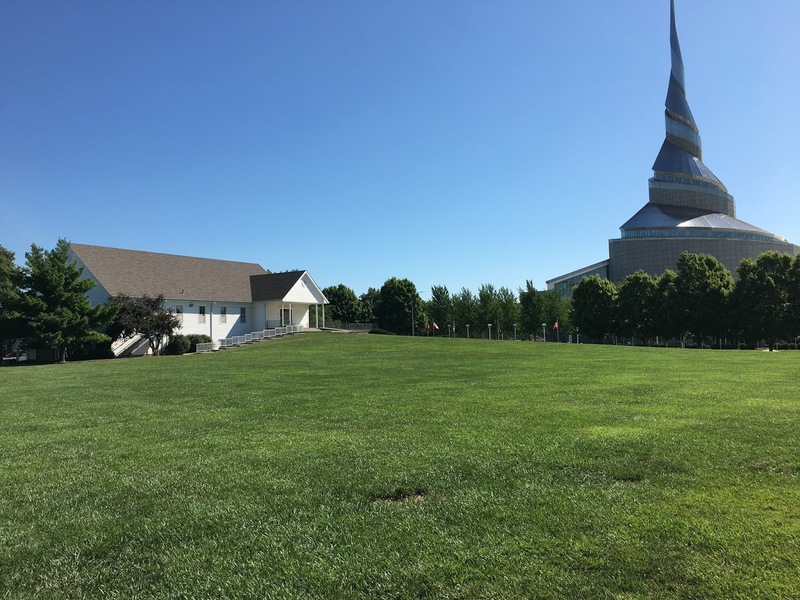 The large building on the right is the Community of Christ Temple, which I toured several years ago. Very cool building designed to look like a seashell. 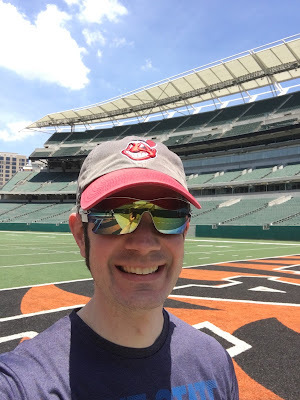 Not only was I able to get four Major League ballparks on my "ballpark bucket list", I also toured two NFL stadiums: Paul Brown Stadium in Cincinnati and AT&T Stadium in Arlington, Texas. 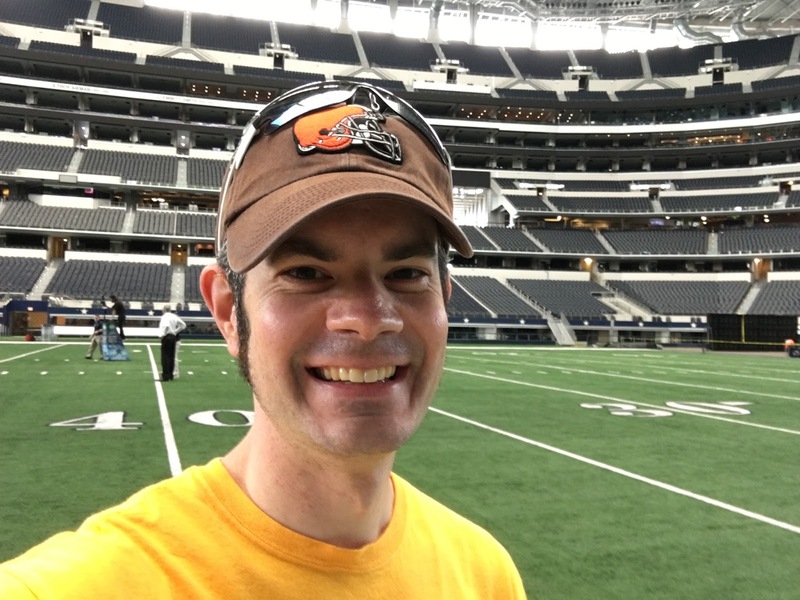 As someone who works in an NFL venue, it was interesting to see how other NFL stadiums function and how they compare with each other. I enjoyed both tours, but also appreciate our setup at FirstEnergy Stadium in Cleveland! 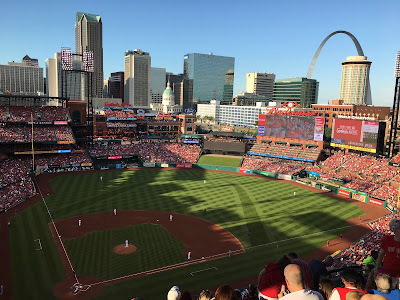 The four Major League ballparks I attended were Globe Life Park in Arlington, Texas (Texas Rangers), Chase Field in Phoenix (Arizona Diamondbacks), Kauffman Stadium in Kansas City (Kansas City Royals), and Busch Stadium in St. Louis (St. Louis Cardinals). Each one was unique and had things I really enjoyed. Slowly, but surely, I'm getting to every current MLB park. 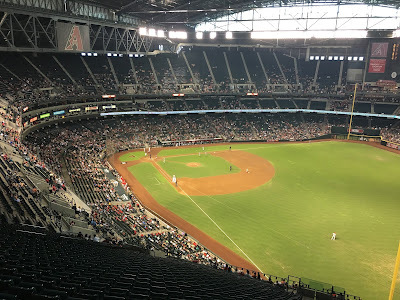 These four brought my total to 19, though 14 of the current 30 since four parks are no longer used (Cleveland Stadium, RFK Stadium, Cinergy Field, and Turner Field). 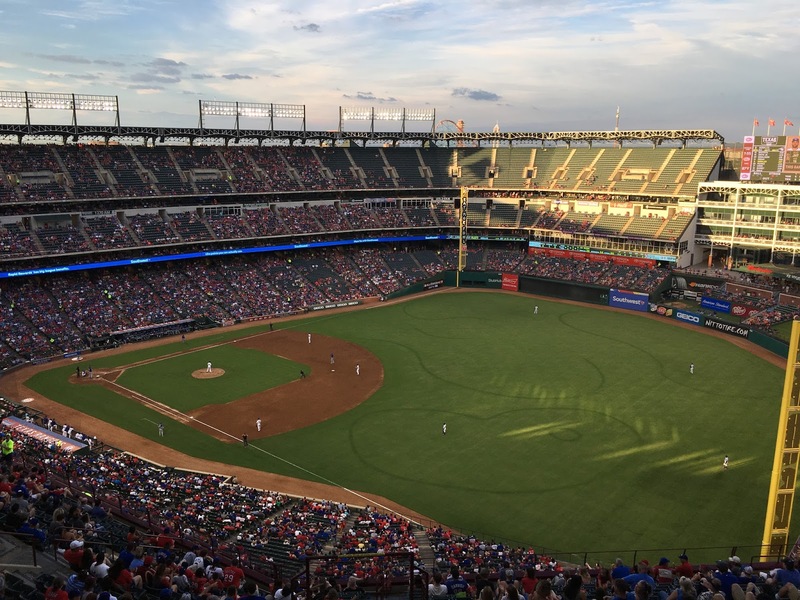 Globe Life Park in Arlington, Texas, home of the Texas Rangers. I got this photo while exploring the park from different seats. Since I sang the anthems for this game, my tickets were down in the lower deck. Chase Field in Phoenix, home of the Arizona Diamondbacks. I took this photo while exploring the park from different seats. My actual seats were in the upper deck behind home plate. 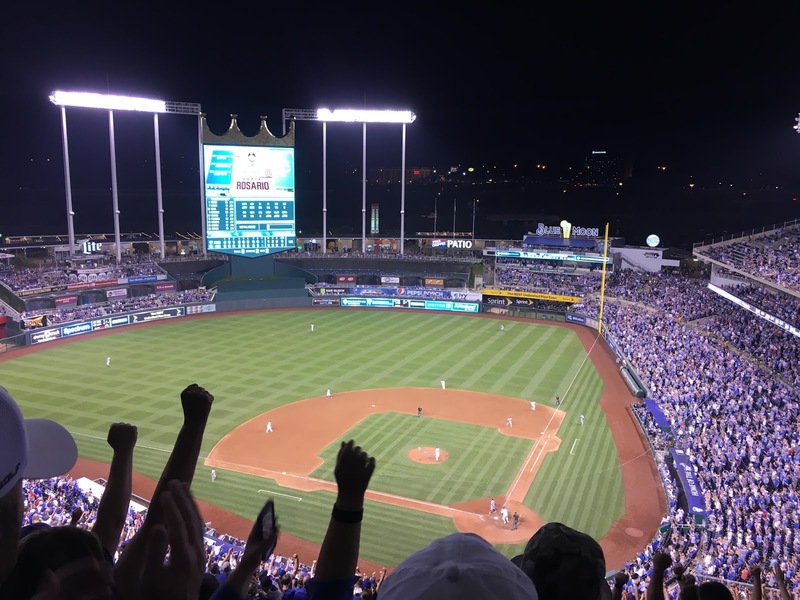 Kauffman Stadium in Kansas City, home of the Kansas City Royals. I took this from my actual seat for the game, which had a fireworks show after! Busch Stadium in St. Louis, home of the St. Louis Cardinals, taken from my actual seats. Not a bad view! 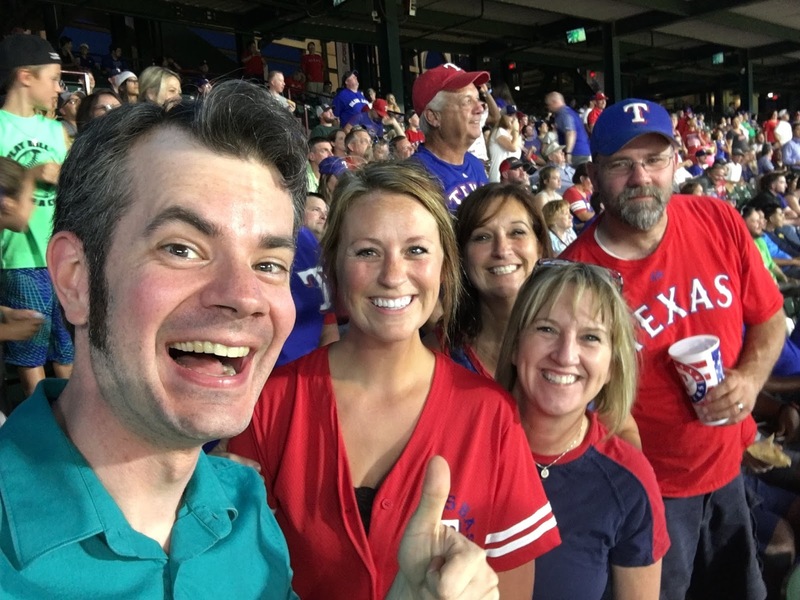 My trip to Globe Life Park in Arlington was certainly my most memorable first game at any ballpark. 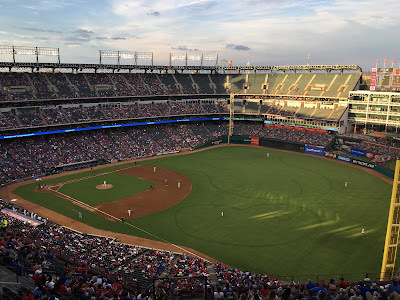 Back in February when I was first putting this trip together, I saw that going through the Dallas-Ft. Worth area wouldn't really be all that much further and I'd be able to get another ballpark in, plus I could stay in Nashville with my brother and his family on the way. 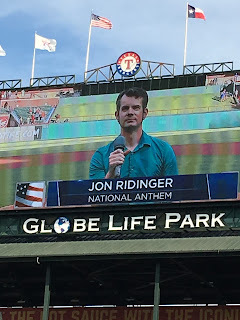 I sent the Rangers an email with my past anthem performances and links to some of my videos, not expecting anything, but figuring it was worth a shot. 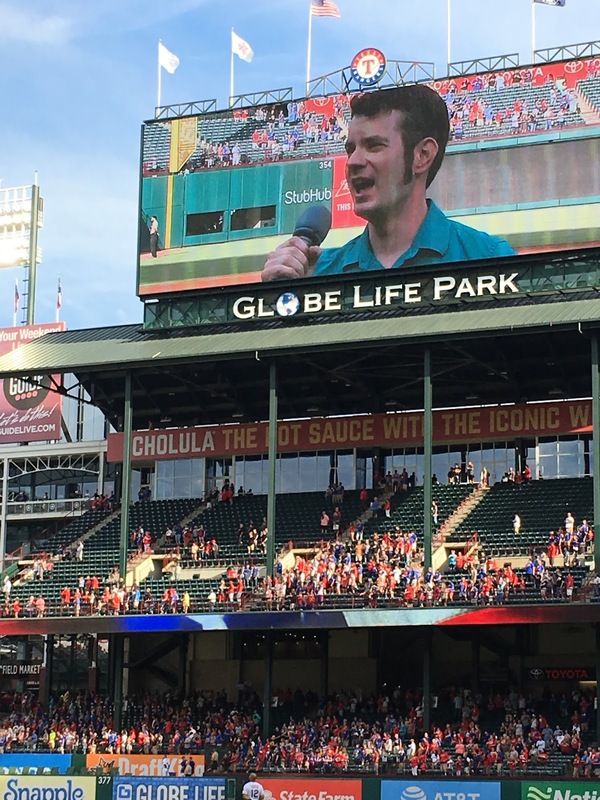 Imagine my surprise and excitement when they responded a few weeks later, asking if I'd be able to sing both the US and Canadian anthems for the June 21st game against the Toronto Blue Jays. 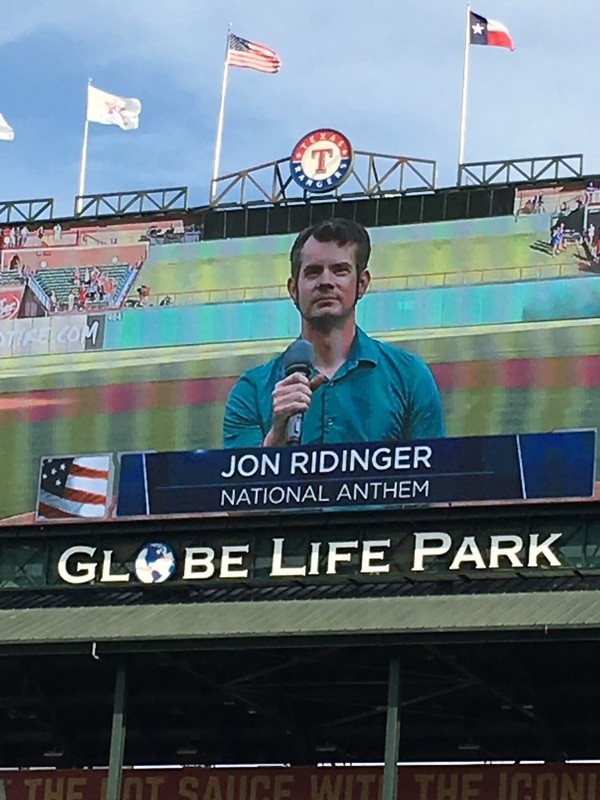 Turns out there aren't a lot of people in the DFW area who know "O Canada", so the timing was quite fortuitous on my part that the Rangers were hosting the Blue Jays in June, right when I needed to pass through. 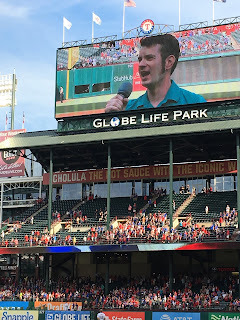 I was pleased how my singing went, and during the game, while I was wandering around the park taking pictures, I got several compliments as people recognized me from singing. 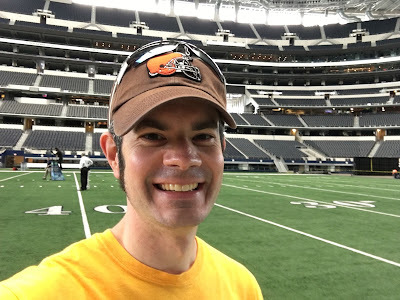 Another fun aspect from the Texas game was because I was singing, I was given several extra tickets. I ended up inviting the Wham family, who I met in Ukraine. They live in the Dallas area and happened to be in Berezhany while I was there last year, so when I was trying to think of people in the area who might come, I remembered them and that they enjoyed going to sporting events. I had a great time with them and was glad we were able to reconnect! 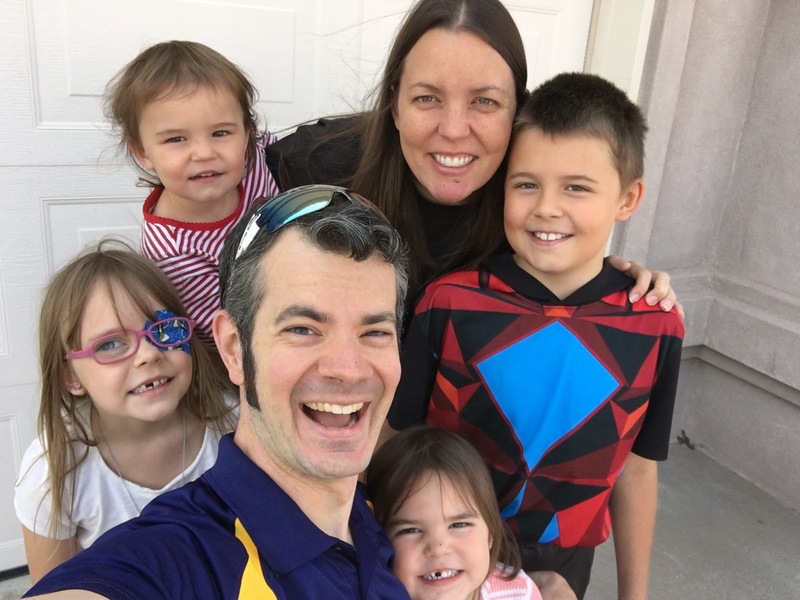 In addition to my mission friends, I was able to spend quite a bit of time with my siblings, nieces, and nephews, both in Nashville and in Indiana. The first leg of the trip was to Nashville, where I spent a few nights with my brother and his family. The final part of the trip was to Indiana, where I visited my two sisters and my youngest sister's family, and spent the Independence Day holiday with them. That was a late change in plans, but I'm glad I did it. 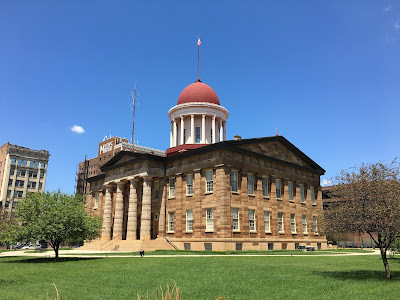 Not only was it a lot of fun and a great way to end the trip, but it also routed me through Springfield, Illinois, where I stopped for some Lincoln history, visiting the Lincoln home, old state capitol, and current state capitol. My last visit was my friend Michelle in the Toledo area, my final stop before I got back to Kent. Michelle and I visit regularly whenever I am out that way, but it was a great way to not only get dinner, but wrap up the trip. 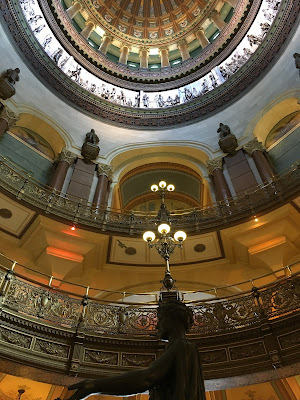 Current Illinois State Capitol in Springfield. Beautiful! Another twist on my return to Oro Valley was being able to visit a family I knew from my ward here in Ohio. 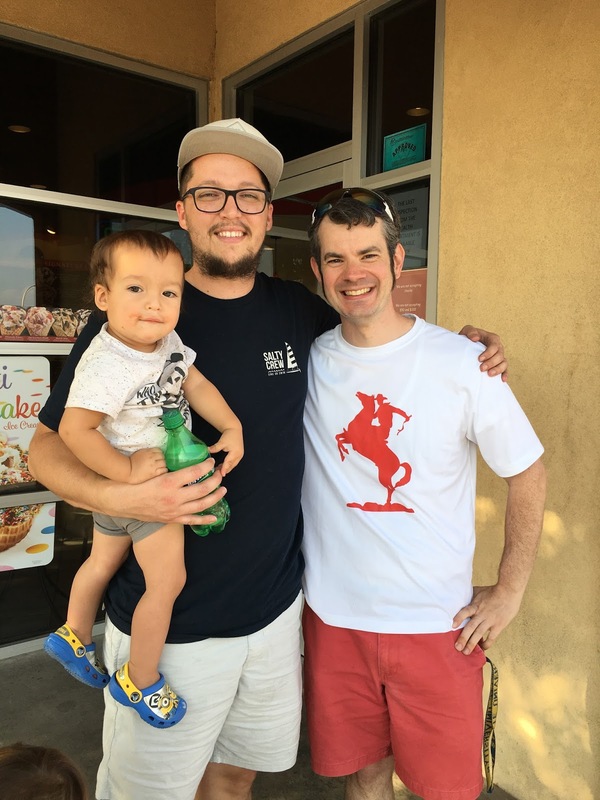 They moved to Oro Valley and actually live in the area I covered as a missionary. It was quite enjoyable for me when they first moved there and starting posting pictures of so many familiar places I hadn't seen in awhile. 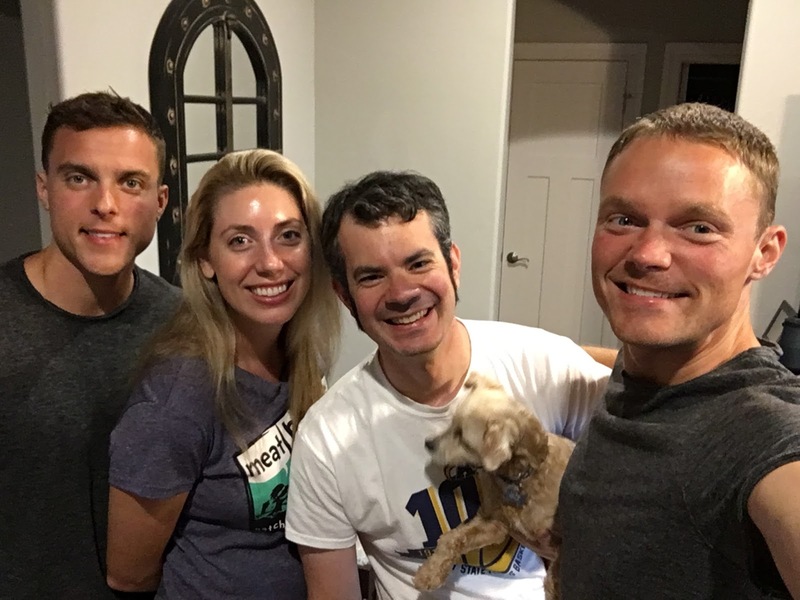 It was great to catch up with them while I was in town! With the Custer family, who I got to know when they lived in Ohio. Now they live in the same city (Oro Valley) where I started my mission! Small world! In Phoenix, the second two nights I was there were spent with a friend I knew from doing This is Kirtland! a few years ago. 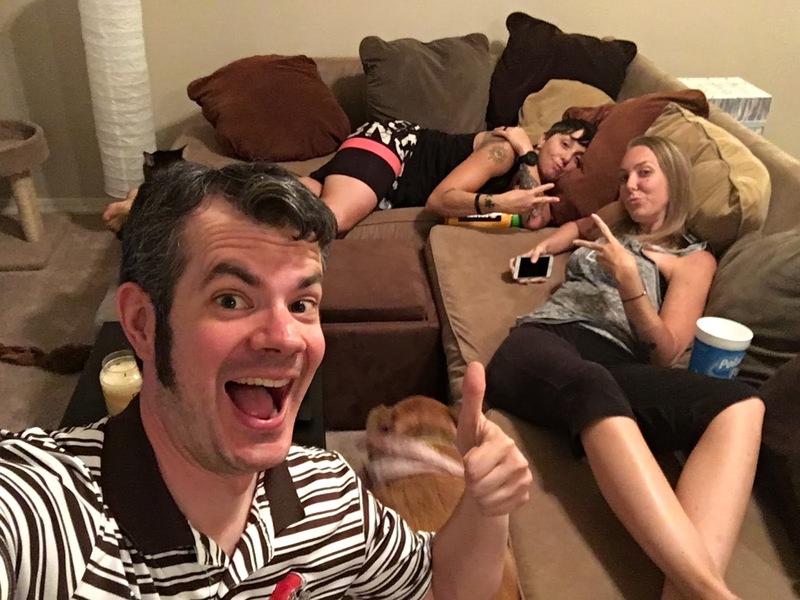 He went to law school at Cleveland State and has since moved to Phoenix and gotten married. It was great to visit with him for a bit and meet his wife. Of course I also appreciated the place to stay for two nights! I was also able to stop a see some other sites along the way that I wanted to see and that broke the trip up a bit. I already mentioned stopping in Far West and Independence, Missouri, to see the LDS history sites there, but I also stopped in Warrensburg, Missouri, (the hometown of my trainer Josh!) and got several photos there of downtown and the campus of the University of Central Missouri. 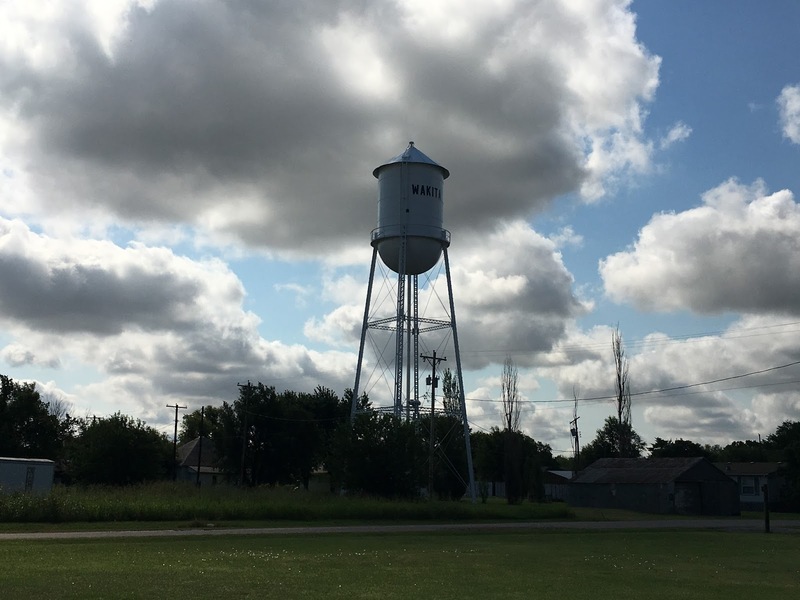 On the trip from Enid, Oklahoma, to Kansas City, I made a brief stop in Wakita, Oklahoma, where the movie Twister was filmed in the mid-1990s. 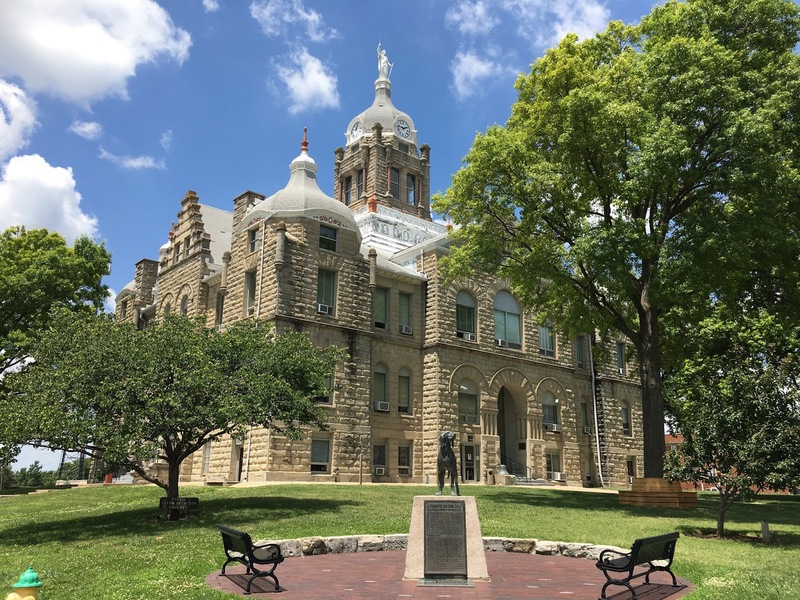 Johnson County Courthouse in downtown Warrensburg with the "Old Drum" statue, which honors the event where the term "man's best friend" comes from. So there you have it: in all, it covered about 4,500 miles and took me to 12 states besides Ohio. I was able to see places I have been wanting to see for some time, and reconnect with places and people I hadn't seen in years, some as long as 15 years. Yeah, missions take you to many places in the two years or 18 months you serve, but I continue to marvel where that mission continues to take me, even over 14 years after it ended. Where will your mission take you?